BRACE 39 April 15, 2016. Theo Christakos vs Kevin Manderson BRACE 39 Apr 16, 2016 (12:57) Theo Christakos vs Kevin Manderson BRACE 39 from the Canberra AIS Arena in Canberra, Australia on April 16, 2016. 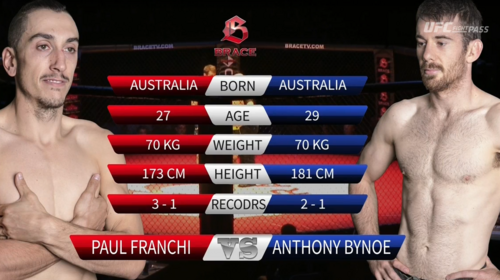 Anthony Bynoe vs Paul Franchi BRACE 39 Apr 16, 2016 (16:42) Anthony Bynoe vs Paul Franchi BRACE 39 from the Canberra AIS Arena in Canberra, Australia on April 16, 2016. 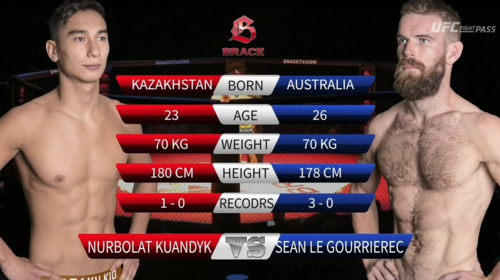 Nurbolat Kuandyk vs Sean Le Gourrierec BRACE 39 Apr 16, 2016 (21:18) Nurbolat Kuandyk vs Sean Le Gourrierec BRACE 39 from the Canberra AIS Arena in Canberra, Australia on April 16, 2016. Caitlin McEwen vs Jess Doueihi BRACE 39 Apr 16, 2016 (14:00) Caitlin McEwen vs Jess Doueihi BRACE 39 from the Canberra AIS Arena in Canberra, Australia on April 16, 2016. 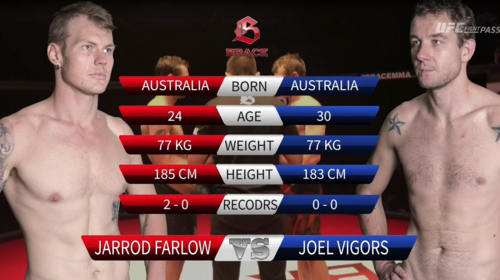 Joel Vigors vs Jarrod Farlow BRACE 39 Apr 16, 2016 (14:47) Joel Vigors vs Jarrod Farlow BRACE 39 from the Canberra AIS Arena in Canberra, Australia on April 16, 2016. Mason Lord vs Joe Pollock BRACE 39 Apr 16, 2016 (19:05) Mason Lord vs Joe Pollock BRACE 39 from the Canberra AIS Arena in Canberra, Australia on April 16, 2016. 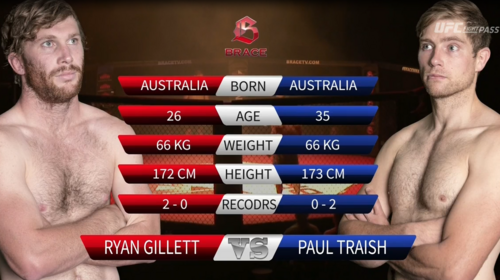 Ryan Gillett vs Paul Traish BRACE 39 Apr 16, 2016 (12:46) Ryan Gillett vs Paul Traish BRACE 39 from the Canberra AIS Arena in Canberra, Australia on April 16, 2016.